Last week, my friend Heidi invited me to attend a launch party for her famous interior designer boss, who launched a furniture/serving ware line at Bloomingdales. It was great fun meeting her co-workers and seeing the beautiful pieces–I already have a list of my favorites. 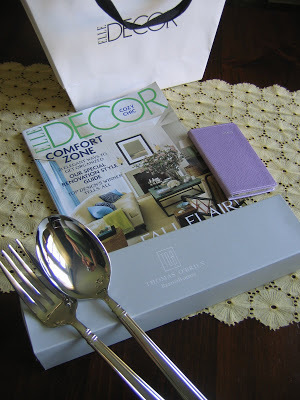 The editor of Elle Decor stopped by to bring the guests a goody bag. Lots of fun treats inside–the September issue of Elle Decor which has an article regarding the launch, an inscripted Elle Decor notebook and a nice serving set, which was one of the new pieces. Afterward, Heidi took me out to dinner for my birthday. It was a lot of fun and a nice mid-week break. The post Launch Party appeared first on Darling Darleen | A Lifestyle Design Blog .